Sepia Saturday 210: Do You See What I See? I haven't participated in SepiaSaturday since May, but I thought I would return to the meme. They provide a weekly prompt for bloggers to search through their files of old photographs. Many of us will have experienced the joy of discovering a precious old photograph tucked away within the pages of a dusty old volume. Now is your opportunity to share such discoveries, or, if you prefer, share your photographic discoveries whether they were found in a bound volume of Shakespeare or in an old shoebox. My mind returns to the photograph on the left. I didn't discover it in a 'dusty old volume.' I discovered it in a digitized newspaper article. 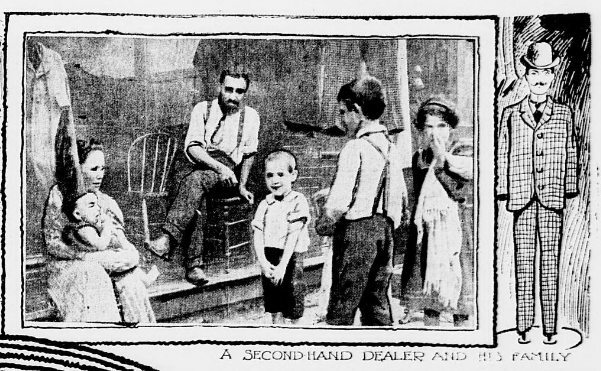 The article doesn't identify the individuals beyond the neighborhood - Little Jerusalem, St. Louis, Missouri, 1900. I had two great-great grandfathers who owned a second hand store at that time. I wondered if it could be the Cruvant family. The few photographs I do have of the family aren't conclusive either way. But the facial similarities are intriguing. At the time, the presence of a baby made the identification less likely. Since I last posted about this photograph, I have figured out who the baby could be, if it is the Cruvant family. Fannie Cruvand, the daughter of Ben and Pearl (Grossberg) Cruvand, was born July 1, 1900. Ben was the nephew of my second great grandfather. According to the census, they lived at 1125 North 12th street, whereas my second great grandfather lived at 1111 Morgan street. Looking at old maps they weren't far from each other. In that case, the mother in the photo could be Fannie's mother, Pearl, or my second great grandmother. Of course, they could still also be a completely different family. My mind could certainly be only seeing similarities it wants to see, and ignoring crucial differences. To be more certain either way, I would need a known photograph of my second great grandfather closer to 1900. A childhood photograph of Sol could also be helpful.